When is recharging not really recharging? 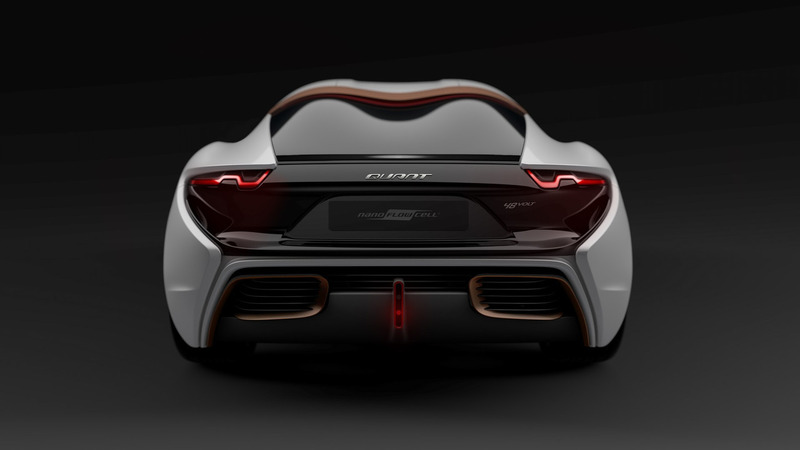 There is a Swiss company called Nanoflowcell that has been talking about a new concept for electric cars for many years now. 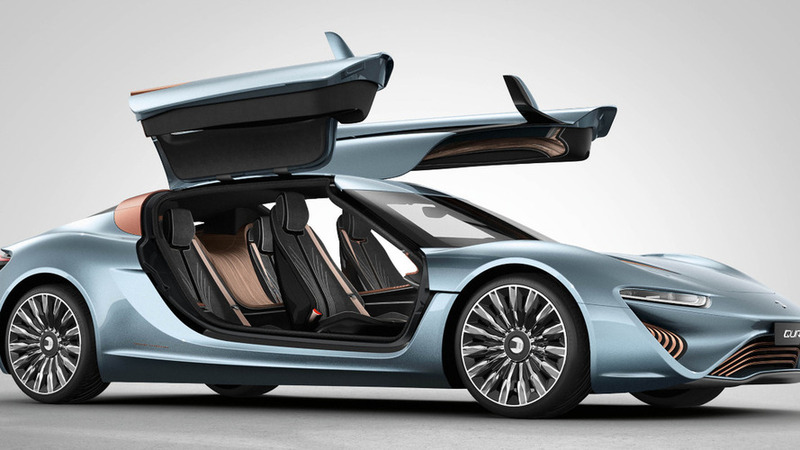 At the Geneva Motor Show next month, it will show off its newest model, the Quant 48VOLT. What makes it special is the fact that it is not an electric car that can be recharged in the traditional way. instead, the battery is replenished, like an ordinary gas tank for a combustion engine. If you have never heard of flow batteries, here's what you need to know. The concept was patented in 1976 by NASA. The idea was to find a better way to store energy for space travel. Batteries can take a long time to recharge and also to release their stored energy, something that does not affect supercapacitors, for example. With flow batteries, storage is greatly simplified. In flow batteries, energy storage is done with ionic liquids, which are basically water with metallic salts. Nanoflowcell says that a kilogram of its liquid is capable of storing 20 times more energy than a kilogram of lead-acid batteries can hold, and five times more than lithium-ion batteries. As a comparison, one kilo of gasoline produces 400 times more energy than that of lead acid batteries, or 20 times more than the Swiss company's ionic liquids. The liquids never react to each other as they are stored in two different tanks. One is for the negatively charged liquid and the other is for the positively charged liquid. 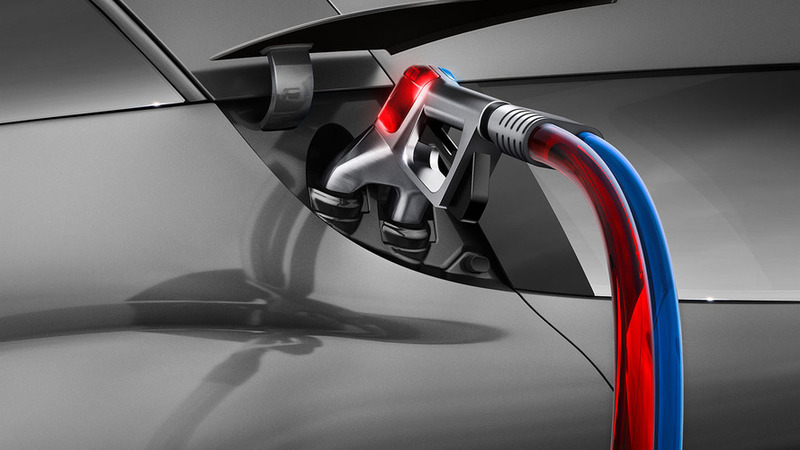 A membrane between them allows only the ions to pass, which generates the energy the car needs. The liquid, used and discharged, is disposed of as vapor, probably after being used to cool the auxiliary battery and the vehicle's motors. The diagram below explains this better. Nanoflowcell technology makes the liquids "interact" through a film. The process generates electrical energy. 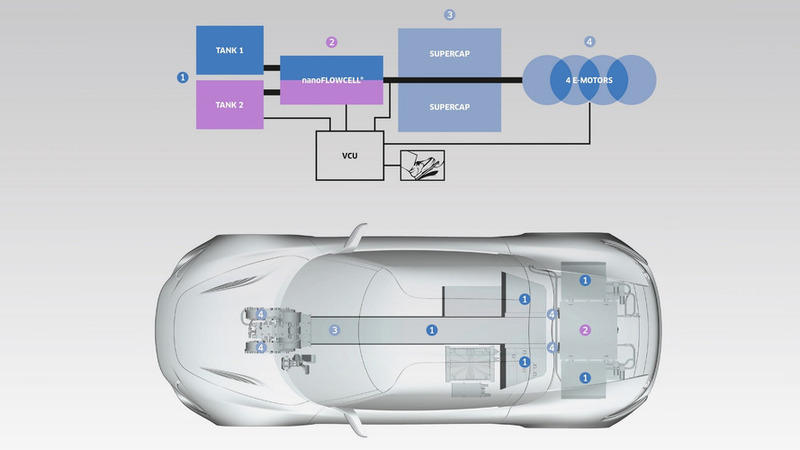 It is then supplied to the four motors (one for each wheel, but mounted in the center of the body to avoid unstretched mass), the supercapacitors and an auxiliary battery, which stores the surplus energy that is eventually generated. The company's first car was Quant e-Sportlimousine. It was 207.1 in. (5.26 meters) long, 79.5 in. (2.02 m) wide, 53.5 in. (1.36 m) high and at a wheelbase of 126 in. (3.20 m). There were versions with 644 (480 kW), 912 (680 kW), and 1,074 (801 kW) horsepower, with the maximum range of around 800 kilometers, thanks to the 105.7-gallon (400-liter) tanks (52.8 gallons, or 200 liters, for each ionic liquid). Like all Nanoflowcell models to date, it was just a concept and never sold. That's because the there's a major technical difficulty here: where would a driver "refuel" the batteries? For the cars to work, it will be necessary to build "supply" stations, which could look like gasoline stations, but would need a lot of changes under the hood. 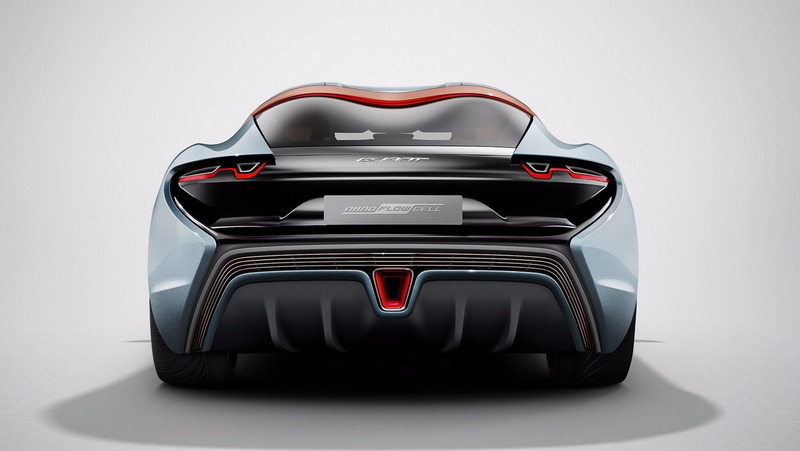 To follow up the Quant e-Sportlimousine, Nanoflowcell showed the Quantino a 153,9 in. (3.91 m) featherweight model, the same size as a fifth-generation Ford Fiesta, but with the same Quant wheelbase: 126 in. (3.20 m). It is also 76 in. (1.93 m) wide and 52,8 in. (1.34 m) high. Then the brand presented a model with an electric system of 48V of nominal tension (the previous ones arrived at 735V). This led to the name of the model that the company will present in Geneva this year. And the new car? Everything indicates that it is an evolution of Quant e-Sportlimousine, as our image comparison below shows. Just now with a 48-volt electrical system. The new model looks slightly louder, but this may just be printing due to the angle of the photos. The rear bumper is also a little different, with two air vents instead of the single, central one that was on the e-Sportlimousine. We know that it can reach 186 mph (300 kmh) and will have a range of 621 miles (1,000 km). More details will be revealed in Geneva. Just don't expect big surprises. What's really amazing here are the flow batteries. They just might be the answer to make electric vehicles viable around the world.